Last night we did a night hike over our perennial favorite Pen-y-ghent organised by Mark Reid of Team Walking. We booked this walk many months ago with a view to getting some prior experience of handling ourselves and kit in low light as preparation of the final ascent night on Kili. We met up with Mark and the rest of his group at the Crown pub in Horton-in-Ribblesdale around 6pm and Mark gave us all a quick briefing around the route, expected timings and also the differences to expect when walking at night such as allowing your night vision to develop by protecting your eyes from direct light, using your other senses to augment your understanding of your environment etc. Conditions were mild and the first part of the ascent was done just in T-shirt and long-sleeved base layer top but as we reach higher ground the sun began to get low in the sky and the temperature dropped. Off comes the backpack and outcomes my fleece. I’m now getting reasonably adept in changing my layers quickly and more importantly anticipating when to do so. This means I’m keeping comfortable without overheating too much. We reached the summit just after 8pm and stopped for a hot drink and snack as the sun set. All the snow has now gone and the steeper section of initial descent is now much easier and quicker to get down although you still need to be controlled in your pace over the areas of looser ground. There was still plenty of ambient dusk light as we came off the mountain but as we reach the lower flanks the light began to fade and out came the head torches. Most of the pathways are limestone and so of a light colour – that certainly helped pick them out in the moonlight / torchlight. We took a 15 minute detour to walk over to hull pot – an impressively sized sink hole when the water course disappears underground into the local cave systems. While we gained a sense of scale under the moonlight I think I’d like to go back for a look and photography of it during the day. On the final few miles back into the village we turned off the torches and just walked in the moonlight. Most of the pathways are limestone and so of a light colour – that certainly helped pick them out in as we made swift progress. I’ve posted the hike’s map and stats and some photos on my Kilimattjaro facebook page. Throughout the hike Mark interjected our stops with commentary about the landscape, questioning the group on our thoughts and understanding of the environment we were in. He’s clearly a passionate advocate of the benefits of getting outdoors and his views and philosophies come shining through in conversation. With just a little moonlight you don’t really need a torch at all. I also need to practice taking pics in the dark. Some people reach the summit just before the sun comes up and I want to make sure I have a GREAT pic to prove I did it (assuming I make it!). Getting to Uhuru peak before sunrise would be a nice photographic problem to have! Still, I’ve now got my nose in my cameras guide book to skill up. I’d also like to get some shots of the camps at night – I’ve seen some that look stunning with long expose shots. A few of my sponsors have promised me some extra donations if I summit so I need to make sure I can clearly capture the evidence! Nice post, I was thinking of doing the three peaks but maybe the whole route in the dark would be a little too challenging. 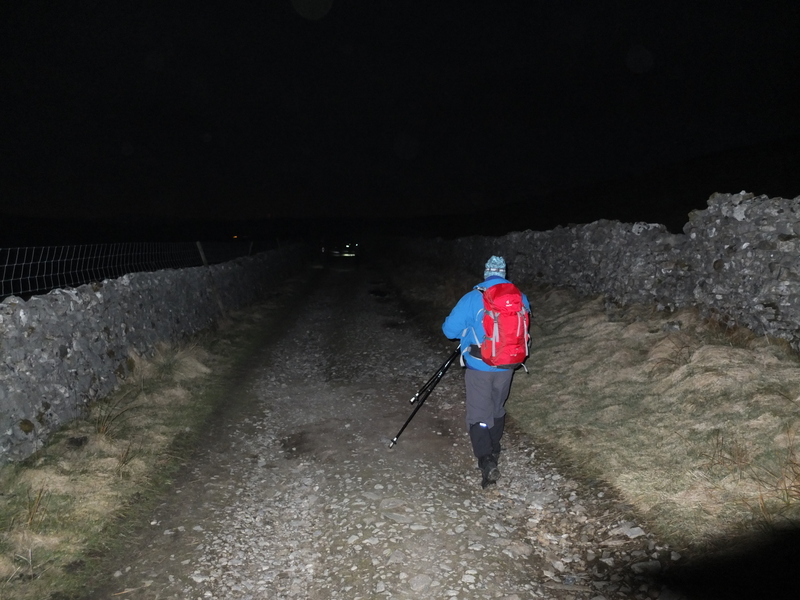 Hi, I think my navigation skills would have to pretty sharp to do the 24 miles of the Yorkshire 3 peaks at night – mine are not up to it ( might do a course post-kili though). I do fancy a go at doing it under the 12 hour mark in daylight – not sure I can convince my team members to have a go before we leave for tanzania though. I think it would be good practice for pushing on when feeling the tank is empty ( like summit night)! Well we’re going to tackle the three peaks (during the day) on Friday 10th of May, you’re welcome to join us if you can sneak a day off work. I’d love to but I can’t make a weekday – I’m using almost all my spare leave allowance to do the Kili trip and still have time for the family holiday. I’m in the dales over the bank holiday weekend so I’ll blaze a little trail for you. Thanks for the invite though, much appreciated Chris.